Innovalia Metrology will present its new high tech machinery based on a hybrid measurement system at stand C-41 of Exhibition Hall 1. This technology combines the classical technique of touch probe measurements with the new high-tech Optiscan optical sensor. The unique hybrid design allows the integration into any system for both laboratory and in-line manufacturing with high precision and speed. 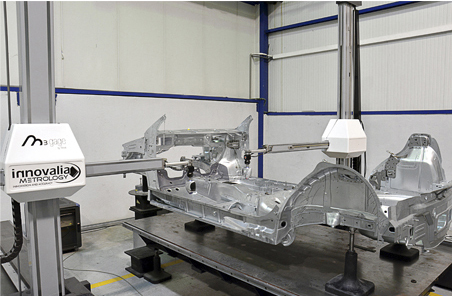 "We can measure the whole chassis of a car in times hitherto unthinkable. Thanks to our SEA Gage "Twin" machine, which has two horizontal arms which guarantee a very significant reduction in the time of scanning, increased productivity and improved quality of data inspection ", explains Jesus de la Maza, President of Innovalia Group. "Through our massive M3 multiresolution data system, we can make high density measurements for large components that can create point cloudsof over ten million points per measured piece". This machine has an air support cushion system which allows for smoother and lighter movement thus achieving a substantial improvement in accuracy and stability over time. The table, available in both granite and cast iron, allows holes, slots and other shapes to be included that could be needed to allow the placement of parts without the need to use tools or supports for positioning. Regarding measurement applications, this model is highly recommended for the measurement of geometric elements, free forms and for reverse engineering.